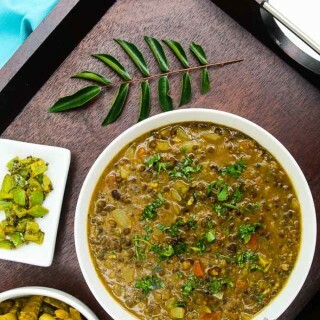 Growing up in an Indian household, lentils were a staple for dinner. From different types of curried dals (soups) to home-made tortilla stuffed with lentils, they were always incorporated into our Indian meals. I’m thankful to my mom for introducing us to the flavors of different lentils early on, and I have tried to do the same with my kids. Lentils are a great source of nutrients and protein, each one being slightly different in taste and nutrition than the other. I try to cook Indian food (specifically traditional Gujarati Indian Food) twice a week in our house. Not only is it one of the most nutritious plant-based meals consisting of veggies and lentils, but it’s also very quick and easy for me to make. I know you’ve heard me say this before, but I don’t post nearly enough Indian recipes, mainly because it’s second nature to me and I rarely write down the recipe when I make it. So here’s me bringing more Gujarati dishes to you passed down from my mom, starting with this Curried Black Lentil (Urad) Soup! 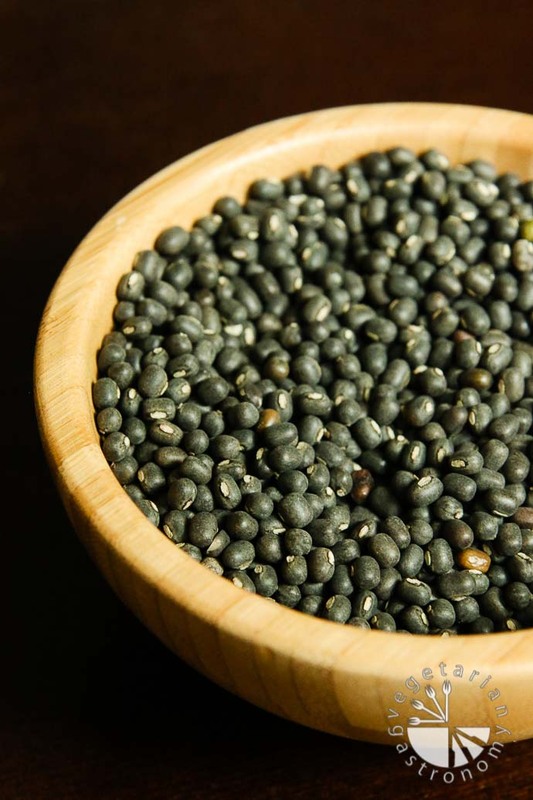 Whole black lentils, also known as urad or black garam, are very similar to whole mung beans in size and shape, but are very different in taste and texture. I’ve posted a previous recipe using split black lentils without the skin (Urad Dal Soup), but this recipe is very different in taste, texture, and flavor since the lentils are still skinned. 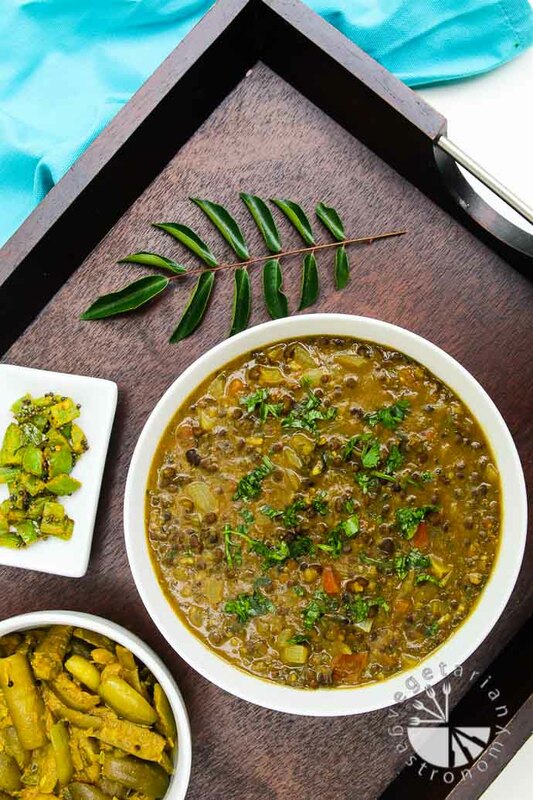 Urad dal has great health benefits, which is why I love incorporating them into our meals. It’s is one of the richest sources of proteins and Vitamin B, and contains iron, folic acid, magnesium, calcium, and potassium. It’s also rich in fiber, making it easy to digest. 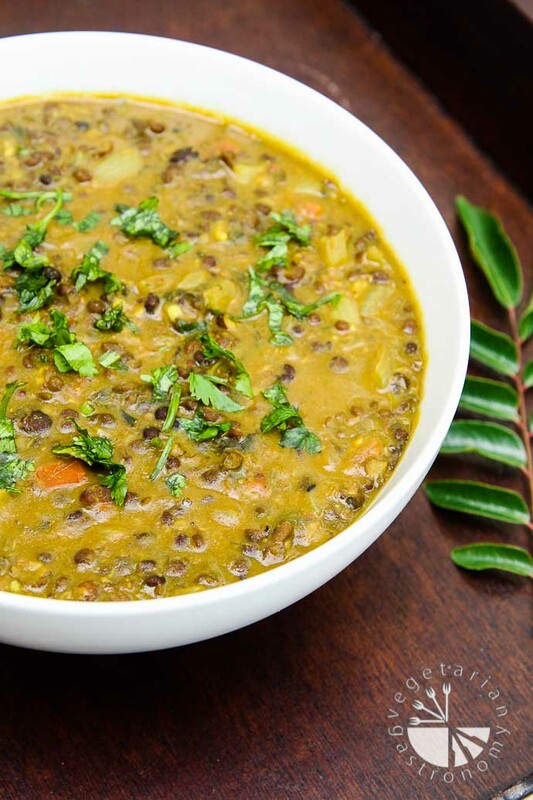 Curry leaves, black mustard seeds, onions, ginger, garlic, tomatoes, lemon juice, and a few other spices all come together with the cooked black lentils to bring you this delicious, hearty, creamy, and flavorful curried soup! It’s a favorite for my entire family. When my kids were babies, I used to serve them a pureed version of this soup and they loved it! I typically plan ahead and cook a bunch of whole black lentils (see notes section in the recipe below on how to cook them) at once in my pressure cooker and freeze them for later use. Once I’m ready to make this soup, I simply pull the cooked lentils out the night before, place in the fridge to defrost, and make this recipe for a quick meal. I’m also loving the new plant full of curry leaves growing in my yard. They smell wonderful and bring so much flavor to dishes such as this one! You can serve this soup (dal) with a side of your favorite vegetable dish (such as the Curried Tindora & Spiced Fresh Jalapenos pictured above), or simply enjoy it with a slice of toasted bread. 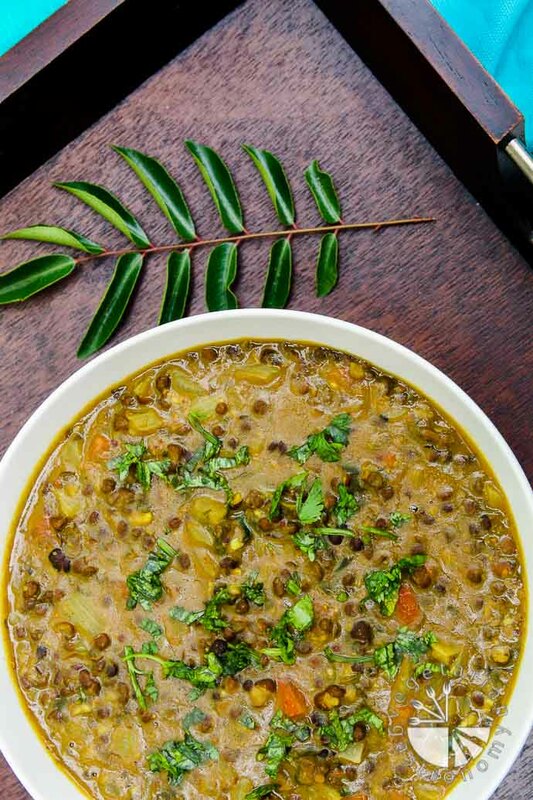 Who doesn’t love a bowl of comforting lentil soup? Especially one that’s healthy, tasty, and easy to make! What’s your favorite lentil? In a large non-stick pot, heat the oil on medium heat. Tear the curry leaves in half and add it to the pot, along with the black mustard seeds and asafetida. Fry for a few seconds until fragrant. Immediately add the garlic and ginger. Fry for a few seconds. Add the onions and green jalapeno chili. Saute until fragrant and the onions start to become translucent. Be sure not to burn the mixture. If you find this happening, either add some more oil or turn down the heat. Add the cooked black lentils, 1 cup water, turmeric powder, and salt. Combine and bring the soup to a gentle simmer. Turn down the heat to medium-low to maintain a gentle simmer. Add the chopped tomato, ground cumin powder, lemon juice, and jaggery. Continue to simmer on low heat. uncovered, until some of the water boils off and the soup becomes thick in consistency (about 10-20 min), mixing occasionally. If you start to feel the soup becoming too thick, you can add a little more water. Add the chopped cilantro. If needed, season once more with salt, lemon juice, and/or jaggery to taste. Simmer for additional 3-5 minutes. Garnish with some fresh cilantro and serve warm with some fresh roti, naan, or toasted french bread. To Cook Black Lentils - Add the black lentils in a bowl. Wash and soak in water for about 20-30 minutes. Drain the water and cook using one of two methods: (1) Pressure Cooker , or (2) Pot of boiling water. Cook the Dal until soft, but not mushy. Drain the water after cooking the dal. I typically cook a bunch at once in my pressure cooker, cool, and freeze leftover plain cooked black lentils in a freezer bag. Then simply thaw and use to make this soup for a quick meal when needed. Asafetida (hing) - Although this powder is naturally gluten-free, it is almost always manufactured by diluting it significantly with wheat flour. There are some brands you can find that make it with rice flour. 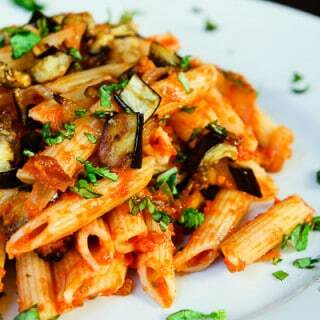 If you are uncertain and have a gluten-free diet, then you can easily omit this ingredient. So glad you liked it! It's a staple in our house, and I've even added shredded carrots and zucchini while it's cooking for the kids so it's a complete meal with veggies and lentils! Glad the adjustments worked out for you. I actually typically cook a bunch of daal in my pressure cooker at once, and then freeze the extra to make this a quick meal when I need and it works out great. Thanks for trying out the recipe and letting me know! Anything lentil and I'm a fan! Me too Rebecca! Love everything about them! Looks so comforting! I love lentil soup and I love all the spices here. 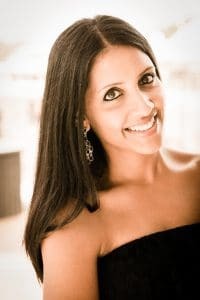 Indian food is some of the most flavorful and delicious foods I've ever tasted! 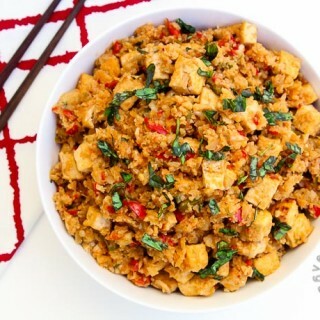 I want a huge bowl of this right now! Thanks Jenn! I know, I love it as well and feel fortunate to have grown up with all the Indian food my mom cooked us. It's quite honestly the easiest most intuitive cuisine for me to make at home, so I keep forgetting to post more Indian recipes. Slowly but surely I'll get all of them on there! I've been on such a curry kick lately. This looks and sounds so good, I definitely need to try it. You will love it Linda! It's so healthy, and so easy especially if you already have the lentils pre-cooked! love lentils as i grew up eating dal on a daily basis too. im completely out of dal in my pantry and will definitely add this on my list to buy. You'll love it! I love the unique flavors of black lentils, especially in this dish! Ah, the spices and colors of this dish! This soup looks really hearty, too. I love lentils! Thanks Uma...black gram is great...it has a unique flavor that I love. I use it for a few dishes, this one being my favorite! I love urad and can't wait to try your soup recipe! Oh awesome! Then you will love this recipe...let me know if you try it! What a beautiful looking bowl of soup and I love all the flavours you have packed in there. I am having a bit of a lentil frenzy at the moment so this is perfect! Thank you! It's one of our favorites and go-to meals. If you like lentils, you'll LOVE this soup!